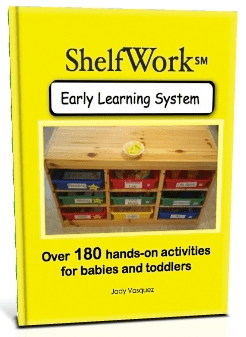 Shelf Work E-book – Jady A. The book shows you step by step on how to set an early learning system for a child, targeting their educational needs. Children of ages 3 months to 5 years old will absolutely love the activities and at the same time learn advanced concepts needed to be mastered by Kindergarten. Who would find this book helpful? – Therapist looking help their clients reach certain milestones such as fine motor development, hand-eye coordination, matching and sorting skills, following directions, completing tasks, and so forth. Give children the gift of learning! BONUS: Schedules and Planners Included!! I just bought your e-book. You helped me a lot with your ideas and video’s and also your answers to my questions. So, I wanted to show you my thankfullness by buying your book and help you in some way (the only way I can from Italy!- If there’s another way please tell me). I’m looking forward to read and apply it (many things, I’m already doing). Thank you a lot. Thank you so much enjoy! !